Brazil visa permits a foreigner to enter Brazil, spend a specified period either as a tourist or as a business delegate in the country. All U.S citizens traveling to Brazil require a visa that allows them to enter/stay in the country. However, visa is not required for citizens of certain European and South American countries traveling to Brazil on tourism. Brazil's tourist visa is issued only for touring the country, or visiting relatives/friends, or for unpaid participation in scientific/academic seminar/conferences, and for unpaid participation in athletic or any competition. However, an invitation/approval letter from the sponsoring organization in Brazil is required in the latter cases. If you are visiting Brazil as a tourist with a valid passport from one of the following countries, then you do not need a Brazil tourist visa. This is strictly restricted for tourism purposes alone and the stay should not exceed 90 days. Andorra, Argentina, Austria, Bahamas, Barbados, Belgium, Bolivia, Bulgaria, Chile, Colombia, Costa Rica, Croatia, Denmark, Ecuador, France, Finland, Germany, Greece, Guatemala, Guyana, Honduras, Hungary, Iceland, Ireland, Israel, Italy, Liechtenstein, Luxembourg, Macau, Malaysia, Monaco, Morocco, the Netherlands, Namibia, New Zealand, Norway, Panama, Paraguay, Peru, the Philippines, Poland, Portugal, Romania, San Marino, Slovakia, Slovenia, South Africa, South Korea, Spain, Surinam, Sweden, Switzerland, Czech Republic, Thailand, Trinidad and Tobago, Tunisia, Turkey, United Kingdom, Uruguay, the Vatican, and Venezuela. However, the stay period for citizens/valid passport holders of Venezuela is limited to a period of 60 days only. Citizens/nationals of Bhutan, Central African Republic and Taiwan visiting Brazil are issued a Laissez-passer. A laissez-passer is a travel document issued by the consular service for people entering Brazil whose passport is issued by a government not recognized by the Brazilian government. If not accompanied by both parents/guardians, a notarized letter of consent duly signed by the concerned parents/guardians should be submitted to the consulate. For children below ages of three months and six years, a certification of vaccination against polio is required. In cases, where the child cannot be immunized, a notarized letter stating the same from the child's physician is required. 3-passport size photographs either color or black on a white or clear background. Brazil business visa (VITEM -II) is issued for business meetings involving purchases of goods and services, exploring investment opportunities, outsourcing, relocation and meetings to evaluate operations or existing contracts. 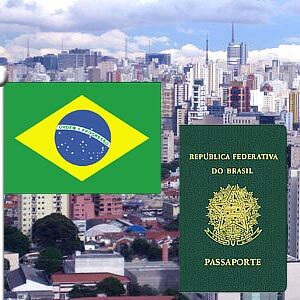 Brazil business visa is also issued for media coverage or filming. If sent on deputation, a letter stating your job description, period of stay, purpose of trip and your payment details during the visit should be detailed on the company's letterhead. If you are self-employed, provide a detailed bank statement that would display enough funds during your stay in Brazil. If you are visiting a partner organization in Brazil, then a detailed letter explaining the relationship between both organizations, the need for travel should be submitted by both the organizations. One passport size color photograph without any glass or head cover. If you are trip includes a visit to the states of Acre, Amap?, Amazonas, Goi?s, Maranh?o, Mato Grosso, Mato Grosso do Sul, Par?, Rond?nia, Roraima, and Tocantins then an international immunization certificate against yellow fever is required. The certificate needs to be produced if you have traveled within 90 days prior to entering Brazil to any country declared by WHO as a country with risk of yellow fever.